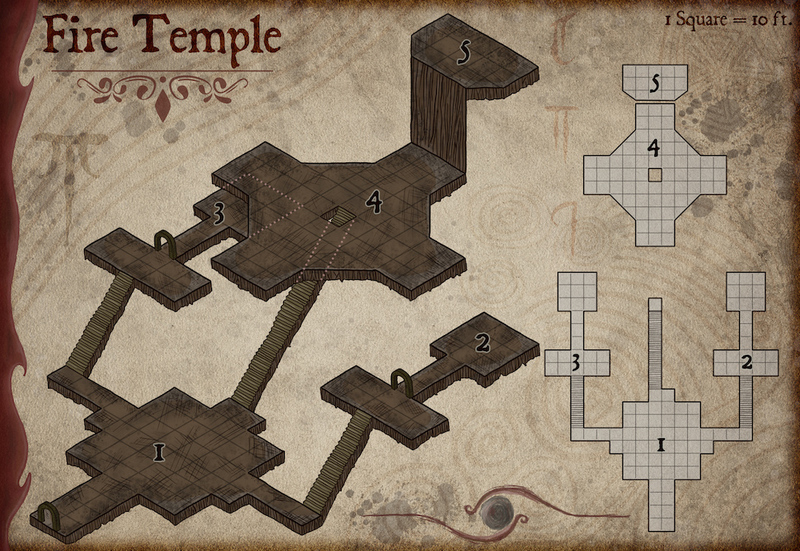 This resource features the general description of an ancient underground temple to the elemental powers of fire. It includes adventure ideas that are appropriate for mid-level (Level 8) adventuring parties. Challenge Rating (CR) is calculated using a party of four as the model. Far removed from the material plane, in the midst of lava rivers and raging volcanoes is the fabled City of Brass. This city is an oasis in the middle of hell but not less dangerous. Powerful elemental entities sit at the top of the chain in the City of Brass. The ruthless and cruel efreeti rule above all others. They control the nobility in the Elemental Plane of Fire from the Charcoal Palace. The Great Sultan Adurnaid was the most powerful efreeti in the Charcoal Palace’s court. It had been this way for centuries. He scorned and despised everyone below his station, even other efreeti. For him, slaves, mortals, and other genies were essentially the same. He was drunk on his own glory and power. His must influential adversary, Caliph Tarun’Fassid spent fifty years concocting a plan to overthrow him. Patience comes easily to immortal beings after all. He paid and threatened three accomplished archmagi from Sigil to craft a vase. The vase was imbued with strong imprisonment magic. They decorated the vase with bas-reliefs of the Great Sultan’s achievements in war and enslavement. A tribute to his ominous figure in the history of the planes. Years later, Caliph Tarun’Fassid had the archmagi killed. A decade later, during the centurial fire festival in the City of Brass, he arranged for the vase to be gifted to the Great Sultan. Great Sultan Adurnaid’s glimmered at the sight of such gorgeous work of art dedicated to his glory. The vase was exquisite, the finest work of art to step foot in the City of Brass. He approached the vase and touched it, running his coarse fingers through the detailed reliefs. He placed a hand on the porcelain lid and lifted it to glimpse at the vase’s insides. An irresistible pulling force generated from the inside of the vase took hold of The Great Sultan. His face changed to anger as he discovered the ruse. Great Sultan Adurnaid’s hand was inside the vase up to his shoulder, devouring him fast. He grabbed his sword with the other hand and tried to smash the vase to pieces. The apparently fragile vase proved to be indestructible, the Great Sultan’s famous sword did not even scratch the vase’s surface. It was then that Caliph Tarun’Fassid laughed in triumph. The last thing the Great Sultan saw before completely collapsing inside the vase was the evil smile of the Caliph. His longtime enemy had finally achieved superiority. Stripped from everything, Adurnaid has spent twenty millennia inside the vase. The Caliph had the vase removed from the Elemental Plane of Fire. It was placed in an underground vault in the material plane to be forever lost in time. Adurnaid has changed during all this time. He is just as evil, but now more scheming and patient. He is still a prisoner to the vase. The only way to release him from the vase is by uttering the vase’s command word. This word is known only by Tarun’Fassid who is the current Great Sultan of the Charcoal Palace. It is also stored in a scroll in Tarun’Fassid’s vault under the palace. The background lore sets the scene for a quest that may bring the adventuring party to the Elemental Plane of Fire. It is set for APL 8, a good moment to up the stakes of the game and introduce extraplanar elements. It is up to the DM to determine whether this adventure is an isolated event, or if it will be the start of an extraplanar quest. The two options for this adventure’s conclusion are explored in the description of Area 5. The Fire Temple is an underground location whose entrance was buried after centuries of exposure to the elements. A recent natural event like an earthquake, a flood or storm unearthed the entrance. It is up to the DM to decide how to give this information to the adventurers. They can either come across it by coincidence or find out about it from gossip and reports in neighboring towns. If they find out from gossip then they hear that some explorers went in and came back severely hurt. Due to the recent visit, some immortal elemental spirits were summoned to protect the place. This large chamber is illuminated by permanent balls of fire on the walls. The walls of this chamber are magically preserved, they still feature ancient illustrations of maps of the City of Brass and faces of the important noble genies. 2 Fire elementals (Monster Manual, page 125) and 6 Magma Mephits (Monster Manual, page 216) guard this room. In the Fire Elemental Plane, it is customary to make a written account of a person’s trial, accusations, and sentence. In Adurnaid’s case, the information was constructed and recorded in a stone disk. The disk is 1 ton heavy. The information is written in Ignan runes. The information in this disk, even if translated will be of little use to adventurers. After all, it is a record of events from twenty millennia ago. If Adurnaid is brought here he is very amused with the disk. It also tells him that the Caliph took his place and station. This room caved in centuries ago during an earthquake. Under a close inspection, the adventurers realize that the stone remains of furniture used to be bookcases. The books decayed long ago. Nothing of value remains in this chamber. A 30-foot tall flight of stairs reaches Area 4 through an opening in the center of the room. The room is illuminated in the same fashion as Area 1. Out of respect for the longtime Ardunaid ruled the Charcoal Palace, this great chamber is a tribute to his deeds. Magically preserved frescoes decorate each wall and ceiling in bright colors. The paintings illustrate Grand Sultan Ardunaid leading ferocious armies, enslaving weaker races, leading from the charcoal throne and fighting with fiery power. There is a higher section of this chamber on its north wall. It is twenty feet up from the floor of this chamber. As soon as adventurers reach this location, a number of elemental envoys plane shift to stop them from acquiring the vase. 1 Efreet (Monster Manual, page 145), 2 Fire elementals (Monster Manual, page 125) and 4 Magma Mephits (Monster Manual, page 216). The imprisonment vase is on top of a marble pedestal. The beautiful craftsmanship of the vase still shines after millennia. The vase radiates a strong aura of abjuration magic if examined with a Detect Magic spell. If an adventurer touches the vase, it responds with a soft vibration. If the vase’s lid is lifted, the efreeti Ardunaid emerges in a cloud of smoke and ashes. Ardunaid’s body is tied to the vase. The lower half of his body is made of smoke and ash, always connected to the vase. If the DM chooses to use this adventure as a seed to further explorations of the Elemental Plane of Fire, then Ardunaid is not completely free to act. He is still evil and will try to manipulate the party for his own gain. Ardunaid explains his position and offers a reward in the form of wishes if the party help him. He needs to be released to grant these wishes. The party will have to travel to the Elemental Plane of Fire, to the City of Brass to accomplish this. 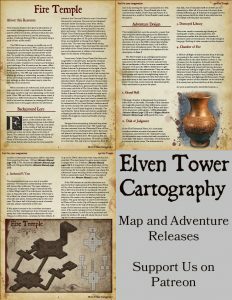 Any events in the City of Brass are out of the scope of this resource and up to the DM to determine. If the party manages to free Ardunaid and restore his powers, he will do as he promised and grant the wishes. He may still abuse the poor wording for his own amusement.